We've arrived! Fancy a sneak peak backstage at the Royal Albert Hall as we prepare for our star-studded 20th birthday concert? Myleene Klass popped in to chat to Tim backstage at the Royal Albert Hall. She's just one of the Classic FM presenters who will be on stage this evening. We hope you'll agree, the Royal Albert Hall looks even better with our logos on. The audience will be arriving in a few hours. 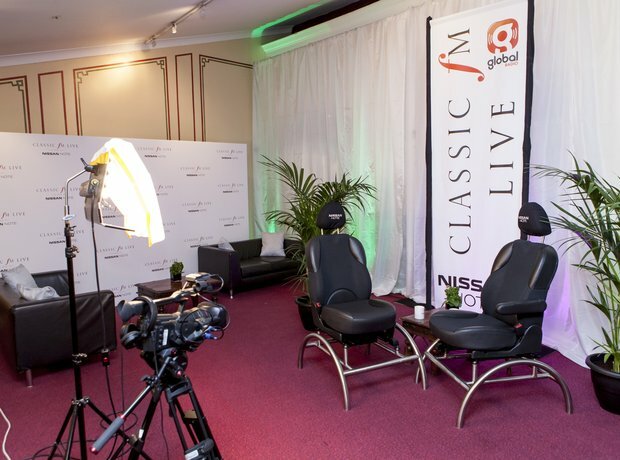 Our Classic FM logo is being beamed out in the Royal Albert Hall! The stage is decked out with chairs in preparation for this afternoon's rehearsals.